Bobcat C15 HD Auger Attach. fits Lg. 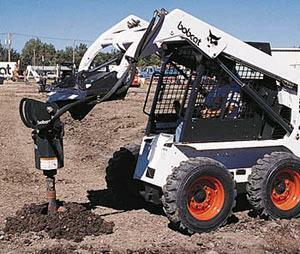 Skid Steer and Fullsize Loader. Auger Bits Available: 9", 12", 18", 24". - 12" extensions optional. Uses: Moderate to heavy digging, rocky soil & occasional tough digging. Med. Torque - Med. Speed - 4' Standard Max. Digging Depth. 12" Clearance Diameter of Drive Unit. * Please call us with any questions about our hydraulic auger bobcat skid steer rentals in Sacramento and Citrus Heights, serving Auburn, Placerville, Woodland, Davis, and Elk Grove in the Sacramento area.